And now for something a little different, this time it’s a vintage guitar amplifier: the Harmony H500. The owner sent it to the shop out of the cabinet to be serviced since it quit putting out any sound. It’s a pretty straightforward circuit with 3 transistors and a handful of passive components and tone controls to adjust the sound. Inside, it shows clear evidence of having been worked on before, and not quite up to standard. The caps were replaced with more or less random values of capacitance and voltage ratings; it was originally fitted with a 40 uF, 30 uF and 2 uF cap. Since the capacitors on something this age always need to be replaced, that was the first step. Afterwards, though, no amplification on the input meant the transistors were dead. I replaced them with new 2N3391s and she fired right up. This little amp delivers about 1.5W of power output from 8.2W at the wall. Not too bad! 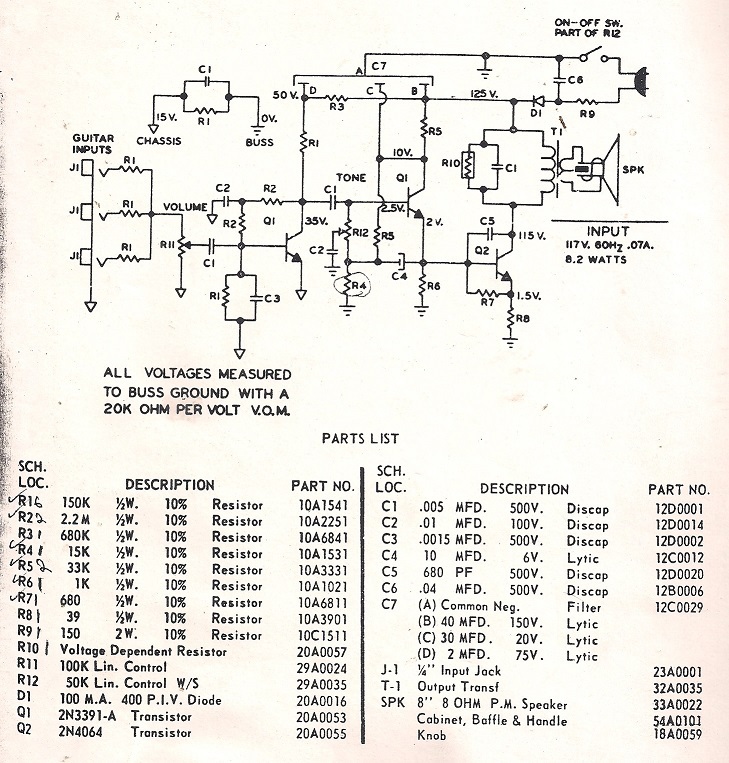 This entry was posted in Audio, Electronics, Projects, Vintage and tagged 2n3391, capacitor, guitar amplifier, h500, harmony, repair, replacement, solid state, transistor. Bookmark the permalink.